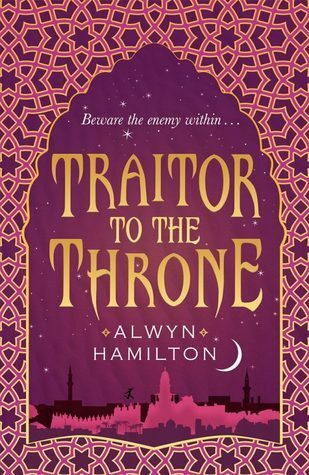 Traitor To The Throne (#2) by Alwyn Hamilton // Do I Sniff Second Book Blues? 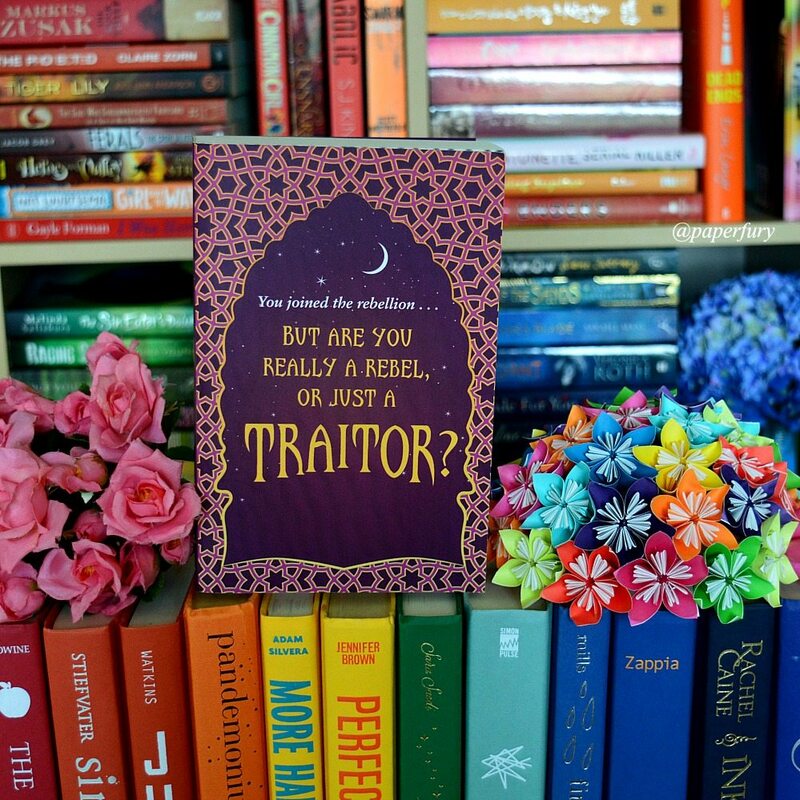 Most unfortunately, Traitor To the Throne (Rebel of the Sands #2) came down with a severe case of Second Book Blues. 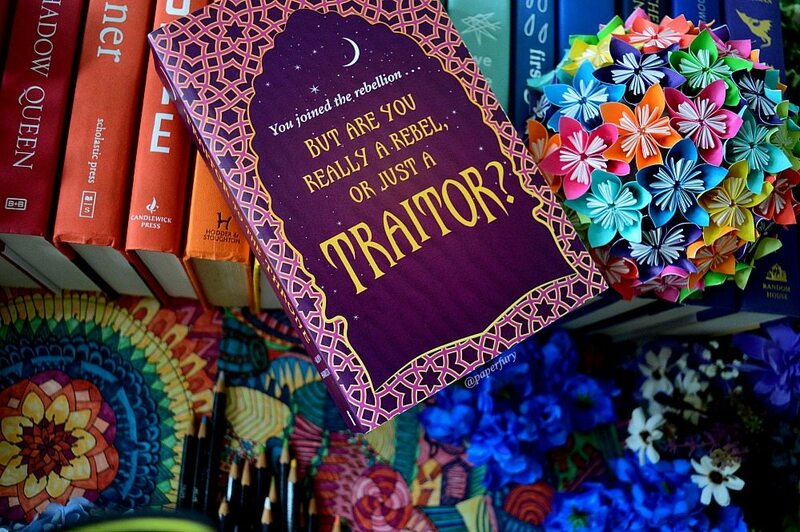 NOTE: The review doesn’t contain spoilers for Traitor To the Throne! Mild spoilers may apply for the first book — BUT VERY VERY MILD. I am being all the careful. I STILL MONSTROUSLY ADORE THE WORLD. I’m a sucker for Persian culture! Even though Traitor to the Throne took a massive faceplant into Political Intrigue Stuff (shh that’s the technical phrasing) I still did like the scuttling about palaces and harems and conspiracy theories. PLUS IT WAS SO BEAUTIFUL! The description was lush and there was tons of backstory for the world. THE COVERS ARE JUST THE BEST. Ha ha to the Americans who had to change covers. (Ahem excuse me, I was not gloating.) But I love the colours and the art and just = I would eat it I love it so. There is lots of magic!! Lots of using the desert as a weapon which I think is an A+ idea because do you know what happens when you get sand in your hair? It stays there. Forever. GOOD WEAPON! These Demdji (which are like the demigods of this culture I guess? Half Djinni x half human) know how to attack. Plus there is still shooting!! Although, sadly, not near as much as the first book. Who Amani’s magical Djinni father is. What happened to some of Amani’s cousins. IT WAS MISSING EVERYTHING I LOVED ABOUT THE FIRST BOOK. Ya. I’m crying too. My absolutely favourite things in Rebel of the Sands were (1) Jin, (2) sass, (3) shooting all the things, and (4) action. Oh Jin’s not dead, don’t worry. He’s just SIMPLY NOT AROUND. And while I appreciate that Amani can be an interesting character by herself (#StrongIndependentYoungWomenFTW) I missed Jin because he featured so much in the last book and was my favourite. AND WHAT ABOUT THE SASS. WHERE WAS IT. WHEREEEEEEE. SPEAKING OF WHICH….MY SHIP RAN AGROUND IN THE DESSERT. It’s not sunk per se. But since Jin is literally not around for like 450 of the 500 page book — IT’S HARD TO FEEL ANYTHING’S SAILING. Before the book even starts, apparently Jin and Amani had this massive argument THAT WE DID NOT GET TO SEE. What?!?? That is not a good way to open a book. How can I, a reader, go from the end of book 1 where they were smooching in the desert, to the beginning of book 2 where Amani is angry at Jin for things I never saw — and yet I’m expected to understand??? Also I 10000% hate the “this is the sequel so the happy couple have got to hate each other” trope. SO MANY CHARACTERS. SO MUCH NO CARE. I didn’t keep up with the 39839 characters and names and then WOAH let’s add in a dozen princes or so that I’m meant to tell apart. I haven’t got a flippity flying clue who’s related to who. THERE WERE CHARACTERS POPPING OUT OF THE SNOW SAND LIKE DAISIES. Plus I didn’t care about these characters. I care about Jin. WHY IS JIN GONE. I do think it suffered violently from sequel blues. Which is ironic because it’s red. But shh, details details. It just lacked nearly everything I loved about Rebel of the Sands?? Which isn’t to say, of course, that YOU will not love it, because you are not me! (Thank goodness. The universe barely handles one of me.) But I’m still giving it 3 stars because I enjoy the world and I still like Amani…but this is still a dastardly disappointing sequel and I am a sand monster of regrets. THANK YOU TO ALLEN & UNWIN FOR THE ARC. 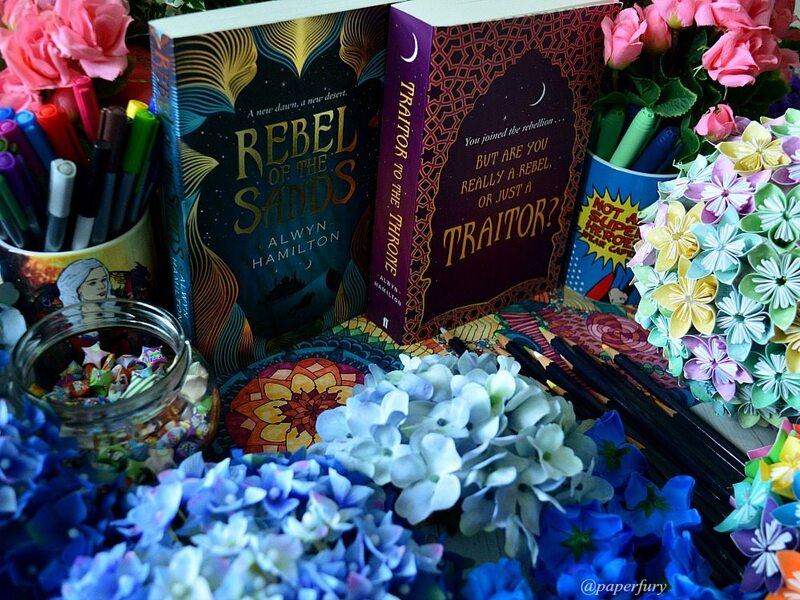 Traitor To The Throne (Rebel of the Sands #2) by Alwyin Hamilton was published January, 2017. Nearly a year has passed since Amani and the rebels won their epic battle at Fahali. Amani has come into both her powers and her reputation as the Blue-Eyed Bandit, and the Rebel Prince’s message has spread across the desert – and some might say out of control. But when a surprise encounter turns into a brutal kidnapping, Amani finds herself betrayed in the cruellest manner possible. Stripped of her powers and her identity, and torn from the man she loves, Amani must return to her desert-girl’s instinct for survival. For the Sultan’s palace is a dangerous one, and the harem is a viper’s nest of suspicion, fear and intrigue. Just the right place for a spy to thrive… But spying is a dangerous game, and when ghosts from Amani’s past emerge to haunt her, she begins to wonder if she can trust her own treacherous heart. how much do sequels scare you?? do you read them avidly or procrastinate them for fear of disappointment??? 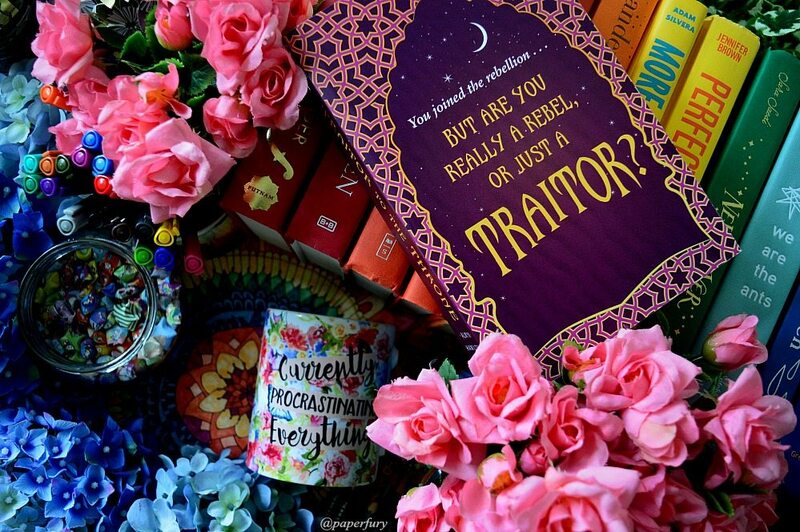 have you read Rebel of the Sands or Traitor To The Throne yet? ARE THESE COVERS NOT DIVINE!! Previous Post: « Should Authors Agree With Everything They Write? Wonderful review Cait! I’ve been really looking forward to this one because of how much I loved the first book but I am slightly disappointed to hear that in over 500 pages, there isn’t much of Jinn at all wtf! FIRSTLY: I am the first comment you should be very proud of me Cait! ALSO I didn’t really like the first book unfortunatley so I haven’t read this book but I’m super sad it had the second book blues. I was very excited for Rebel of Sands because I LOVE BOOKS SET IN A WESTERN AREA, but it just fell flat for me! YAY I AM PROUD OF YOU JULIA…although I think Jeann just squeezed in like 1 minute ahead of you. hehe.🙈🙊 I’LL GIVE YOU CAKE ANYWAY BECAUSE YOU’RE AMAZING. 😜 Aww, I’m sad Rebel of the Sands didn’t work out for you! I doubt the sequel will improve things for you tho? Might just be not a good series for you, eh? NO SHAME! Eeep, we’re in the same boat then, Hana. 🙈🙊 I really want to like sequels?! But often time if the first book was just soooo good, the sequel has so much to live up to! Ah, I mean, I don’t think the story ended at book one. It only set up the world/rebellion. I don’t think it should’ve been a single book. That’s fair too! It’s hard when we realise we can’t read all the books of ever, right?!? I hope you find like ALL really excellent books this year!! Oh, yes, sequels can be hard – especially if the author has already determined he/she is writing a trilogy. The middle book syndrome is the worst. I think it’s something authors/publishers need to break out of, and figure out that making each book in a series important to that particular story is a LOT more necessary than following the tropes! It can! It’s really frustrating. Like I almost wish there were more duologies so we could go straight from “set up of the awesome” to “finale of the awesome”. Not that I would call this book pointless or anything…it just really didn’t capture my attention. *sad noises* (And omg the second-book-tropes are killing me. That’s too bad! I’m still really looking forward to this, but I hate when books suffer from the sophomore slump. I completely agree with you on this book. I was SO sad about the lack of Jin, guns and sass. I mean, whut even are you thinking book? WHUT EVEN?? Like whyyyyyy. WHY. I have no clue why a book would just cut out a character everyone loves for no reason??? ?😭😭 It’s like Chaol betrayal all over again. Second-book blues are the worst. I can think of very few series where the second book was better than the first. Why is it (especially in YA) that a major character always has to be MIA in the second book? Just a typo. I had severe internet issues while writing this and my computer froze after every sentence. I don’t find sequels to be scary unless its a contemporary sequel. Contemporary just scares me overall because if I find a contemporary I like, someone always dies! Why?! Why do they do this to me?! I can name a hundred contemporary’s I love and probably like 90% of them have death in them. Maybe my inner love for fantasy and stabbyness (yes, that’s a word) seeps into my choices of contemporary. Sometimes I procrastinate sequels, and I have no idea why. Like I have the next book, I loved the first one yet my hand still decides to choose another book. I recently unprocrastinated (I’m speaking Leahtopian now!) reading The Cursed Child. I’m not a huge Harry Potter fan, but why did no one tell me The Cursed Child would be better!!! I love it! Some of the names are weird though. Like “Scorpius,” what was Malfoy thinking! Where did that name come from? Every time I read it I’m like this is still weird. Have you read The Cursed Child? I also kind of don’t like the title, but I think that is just a personal preference. Does this make your more afraid of starting THE ROSE & THE DAGGER? Sequels don’t scare me because I usually forget about them. I bad with series because there are so many other amazing books. Although I’m sad that this book wasn’t as good as the first one because that was amazing. Oh well. Bahaha, I get that!😂 I constantly forget to read series too…although I think, for me, that’s because I’m scared of potentially awful sequels. 🙈🙊 Am I a true wimp? YES YES I AM. DANGIT SEQUELS. GET YOUR LIFE TOGETHER. I mean, I’m still going to read it, but DANGIT. Ooooh. See, I like me some political intrigue, I do. AND I thought the first book was too short (I think? Let me check…YES!) I didn’t like how much time passes between one chapter and the next, and how I felt like I didn’t really get to know most of the other characters because of the missing time. So I’m hoping I’ll get to know more of the characters in this one! So a slower pace, political intrigue, more backstory to the world (I think you said this somewhere, but I can’t find it, so if I’m wrong, ignore me. But I could have sworn I read it.) = MY BAG! This makes me super excited, because I did feel there was a bit of a disconnect in the first book. But I’m sorry you didn’t enjoy it as much as you’d have liked, Cait! I generally don’t have a problem with sequels, it’s endings I have a problem with. I just don’t like things ending. Great review, Cait! I am the all time worst at finishing series in general, although I am getting better I swear. BUT, this has been goof, because I have never experienced the sequel blues! I KNOW LIKE HOW HAVE I MANAGED THIS. I do know the legends and tales of these beautiful first books to a series that are followed by the not so great little sibling that still like whines and doesn’t understand the way you like to play certain games so you don;t even really want them there, but your mom MAKES you let them play and so you sit in silence and don;t move and hope it goes away. And maybe that is dramatic, but that about sums up what people tell me. Honestly, though just hearing you talk about the series at all makes me want to pick it up. I don’t think I would be nearly as frustrated while reading it if I knew that at least you were frustrated as well. Is that bad? Oh noooooooo! 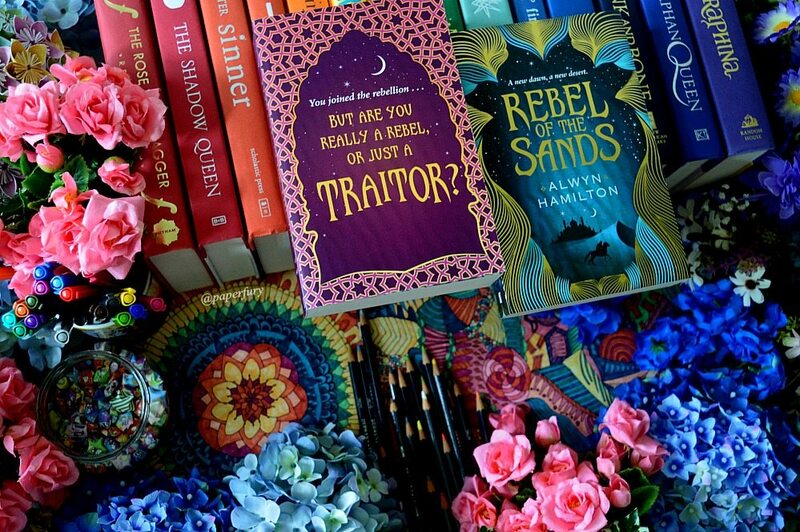 I absolutely adored Rebel of the Sands (and JINNNNNNNNN omg) and was so excited for this one! I’m so sorry to hear it suffers from second book blues 🙁 I will definitely still pick it up, but with considerably lower expectations! But nooooo why is Jin not in this book for the majority?? I absolutely loved him agh. Great review, though Cait! I love Jin so much too omg. And I think without him there to banter with Amani, that’s why the sass was seriously deplete???? SO SAD. I’m actually not that scared of sequels. I mean, it’s either going to be better, worse, or the same. USUALLY, if the first book was good, the second book is also likely to be good (but that doesn’t mean it will be better). There are exceptions though. A lot of the time, first books are better than their sequels. I think it’s because of many reasons, all of them I am too lazy to think of at the moment. Yeah, duologies are great. Especially without that slump. DID YOU SEE LEIGH BARDUGO’S NEW BOOK ANNOUNCEMENT TODAY?!!??! It’s a collection of Grisha short stories. 😍😍😍😍 And she 100% confirmed that this wouldn’t even be the last time she writes in the Grisha world. I AM SO HOLDING OUT FOR A PRINCE NIKOLAI SERIES OMGGGGGG. Yiiiiiikes. I kind of had to skim this review (mucho apology!) because I’m still weighing getting into the series at all. LIFE IS HARD WHEN 50% OF YOUR CREDIBLE SOURCES LIKE SOMETHING, AND 50% OF YOUR CREDIBLE SOURCES KIND OF WANT TO BURN IT WITH FIRE. With Gemina and ACOMAF and all these trilogies wherein the second book was actually stupendously spectacular, I was hoping that the second-book-syndrome is sort of dying down, but… RESURGENCE! RUN, AUTHORS, RUN! I’VE SEEN IT SPREAD LIKE PLAGUE BEFORE! Granted, 3 stars isn’t bad, but why, oh why would a sequel add like 200 pages of conversation and Slow-Pacing-Little-Action-No-Good-Very-Bad-Dragging, whyyyyyyyy? Let’s hope at least it follows in the wake of those series which justified a sucky #2 with a spectacular #3? Yay? I totally understand, don’t worry. 😂 I don’t even read reviews for books I’m absolutely going to read half the time, because I want to go in with aaall the surprises. 😉 And omg it’s very frustrating when one’s bookish-twins disagree on books. Like what am I supposed to do here??? Do all the work for myself??? What is this life. I just don’t get why people are so allergic to having small, concise books.😂 I’M SCARED OF GINORMOUS AMOUNTS OF PAGES, SOMEONE PITY ME. I was waiting eagerly for this book! Ugh. I think I will still read it though, skim through at my pace. But I totally don’t understand why Jin isn’t there???!!! I mean?! WHY EVEN??!?! On second thought, I’ll wait for the third book and if it’s good I’ll read it. I trust your judgement, your majesty. LOVE the sass in this post btw! I don’t even get it?!!? And like this seems to be a popular trope for sequels and I don’t get it. Why put together a power team and then not USE THEM AS A POWER TEAM.😭 If you do try it, I hope you like it better than I did!! Reading this kind of makes me happy I did not pre order the book. I did enjoy Rebel of the Sands but I can’t seem to get excited for this sequel at all. *cries internally* So I’m disappointed to here that Jin has followed the sass and left. It’s sad when sequels don’t live up to their debuts. And the whole part about beginning with the aftermath of an off-the-page fight? WHAT?! That’s should be illegal. All the same, I’ve got to read it. Because, you know, loyalties have already been aligned. It should definitely be illegal. *nods* If you’re going to have character changing developments WE NEED TO SEE THEM. *breaks a plate* 😂 Here’s to hoping you like it better than I did though! Oh no! Not second book blues ): I’m planning on reading it soon, I’ll lower my expectations a bit and prepare myself for less Jinn. Thanks for the review, Cait! I hope you enjoy it more than I did, Cyn!! Hey! Awww I’m so sorry you didn’t like this book! I fortunately loved it! I completely agree there wasn’t enough Jin! I love your review! IT BREAKS MY HEAR THAT JIN WAS JUST…ABSENTEE. I mean, he is the life of everything here?? 😜😜 I do hope you have better luck with it than I did! I recently reviewed this book too. I enjoyed it but didn’t love it as much as the first. I don’t think it suffered too badly from middle book syndrome, but it definitely had its problems. The main one being it was about 100 pages too long. I feel it could have been shorter, it started to really drag at the end. And, oh, I missed Jin so much. I wanted all of his humour. And I missed Amani with him. I kind of liked that Amani was stripped bare in this, she couldn’t rely on her skill as a shooter or her powers to help her, she had to try to outsmart and outwit others and I found that really interesting. I am very excited for the third book though, I think Alwyn will really deliver with that, at least I hope she does.